Dans un premier temps, Fritz Lienhard analyse la crise de la théologie au sein du ministère pastoral. Il reprend ensuite la définition que donner Schleiermacher de la théologie : une interprétation en vue d’une pratique. Ainsi la théologie est plutôt un procédé qu’un corpus, et son enseignement est davantage celui d’une méthode que la transmission de connaissances. 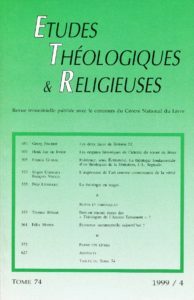 Dans cette perspective, la corrélation entre expérience et textes théologiques se trouve renouvelée. This article attemps first to analyse the crisis of theology within the pastoral ministry. It then suggests a way out of this crisis by reiterating Schleiermacher’s definition of theology as interpretation directed towards praxis. Accordingly, theology is more a procedure than a body of knowledge and its teaching concerns more a method than the transmission of information. The aim of this perspective is to establish a new understanding of the relation between experience and theological texts.